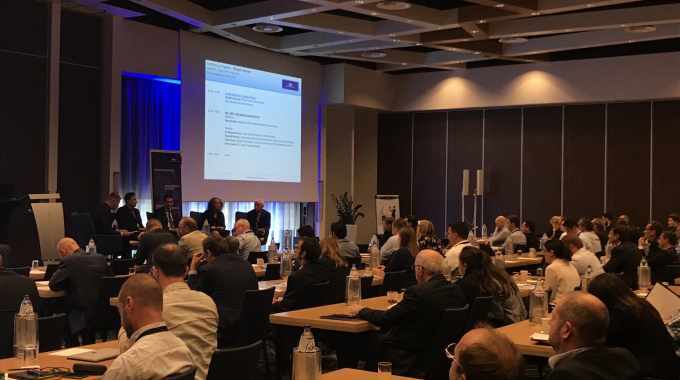 AWA Alexander Watson Associates hosted the 2018 IMLCON, IMDCON, IMECON conference in Amsterdam in September. The event, which alternates between Europe and North America, featured an expanded program investigating the tremendous growth in the use of in-mold production in end-use market sectors as diverse as cosmetics, pharmaceuticals, electronics and automotive. The agenda spanned not only in-mold labeling, but also in-mold product decoration and in-mold electronics. Corey Reardon opened the plenary session on the first morning, defining the scope of the event’s different streams and providing market profiles. Setting the event’s context, Arthur Erdem of label and flexible packaging paper manufacturer Brigl & Bergmeister explored innovation management, and Udo Weustenhagen of thermoformer Niebling outlined the benefits of high-pressure forming of decorative or functional parts. This introduction led into a panel discussion moderated by Corey Reardon, which encompassed all aspects of in-mold production, and for which Arthur Erdem was joined by Dr Margreet de Kok, senior scientist, IME lead, TNO Holst Center; Marshall Paterson, VP new product development, Advanced Decorative Systems; and Isidore Leiser, CEO Stratus Packaging Europe. It provided significant insights into current and future developments across the lively in-mold markets. The session focused on in-mold labeling and product decoration brought together speakers from value chain participants Arjobex, Berhalter, Brigl & Bergmeister, HP Indigo, Serigraph, Stratus Packaging, Taghleef Industries and Yupo, who between them explored developing opportunities, following an update on current market status and data from AWA. The one-and-a-half day program constituted a thorough study of current status. Corey Reardon commented: ‘It represented a coming-together of technologies that will significantly impact our future. The relationship between in-mold labeling, in-mold decoration and in-mold electronics provides exciting developments and opportunities for value creation and growth across the industry.